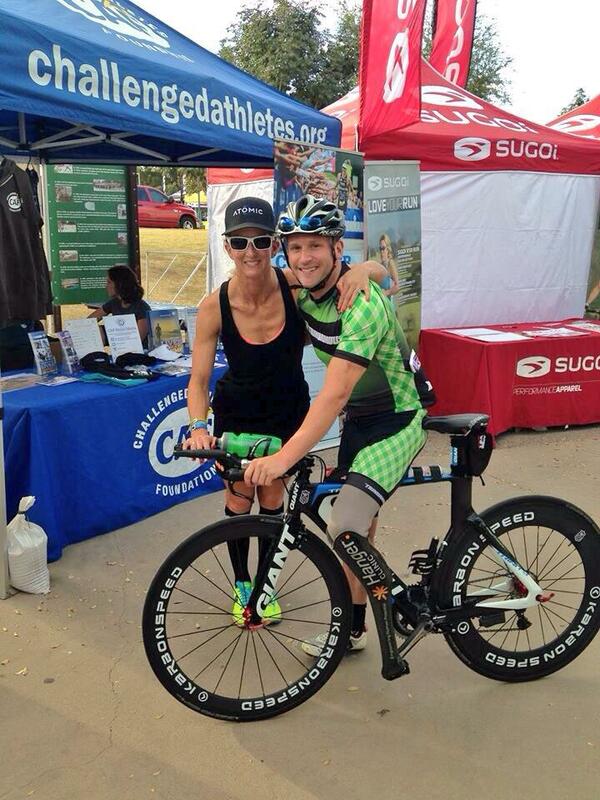 Home/Blog/Impact Lives: 2014 Annual Challenged Athlete Foundation Cycling Challenge! Ride to get to the finish line...TOGETHER. Enrich your life by impacting theirs and sharing your day with us - we look forward to having you! 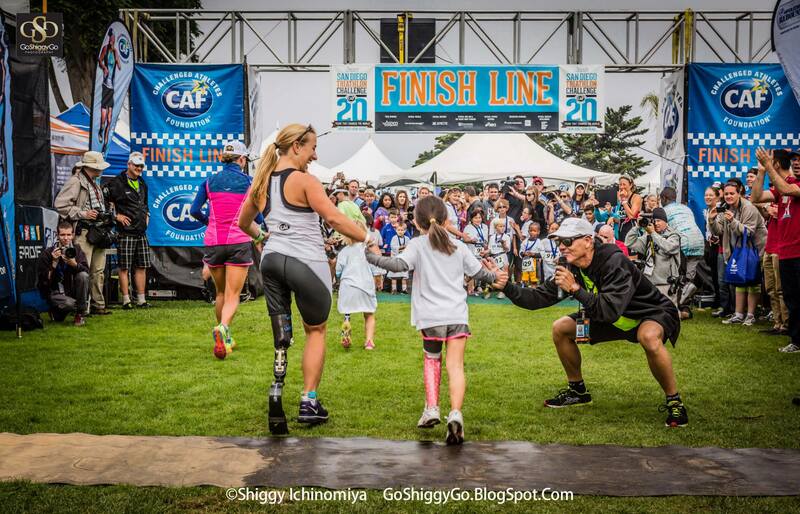 The spirit and generosity of the Challenged Athletes Foundation is something to value and take pride in being a part of as much as possible. It is so moving to be able to help individuals overcome their personal hardships to be able to experience this world in the way it was meant to be, in a manner that might have seemed impossible before becoming a part of the Challenged Athletes Foundation. 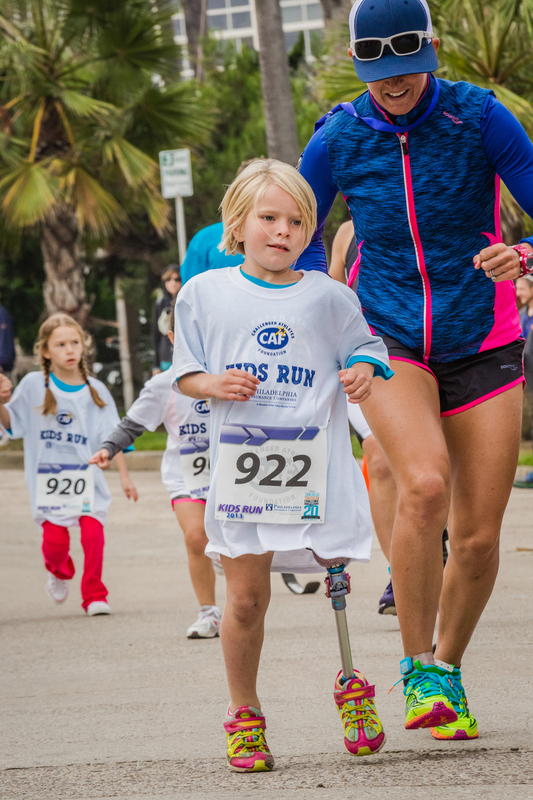 It is the mission of the Challenged Athletes Foundation to provide opportunities and support to people with physical disabilities so they can pursue active lifestyles through physical fitness and competitive athletics. 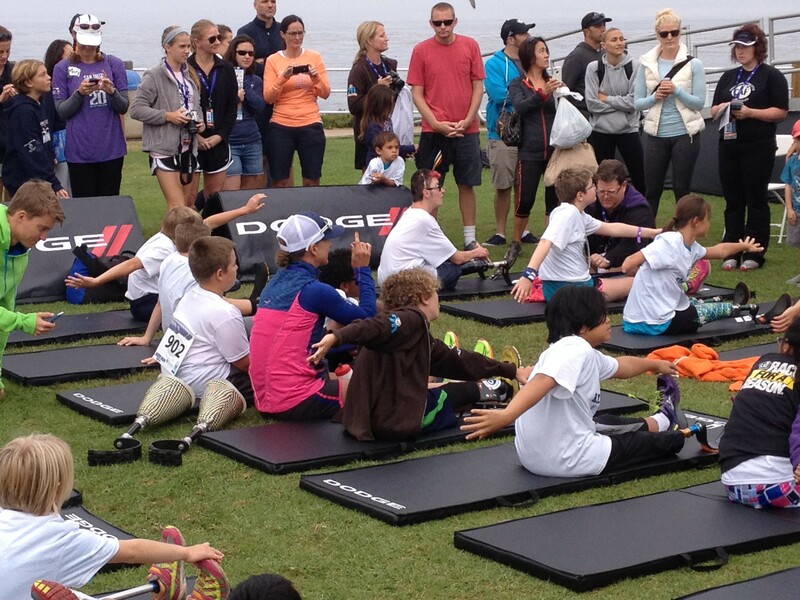 The Challenged Athletes Foundation believes that involvement in sports at any level increases self-esteem, encourages independence and enhances quality of life. This is 100% why the annual cycling challenge event was created for the past several years – for the betterment of others so that an active lifestyle is POSSIBLE even with this type of adversity. When things get tough on the Ironman course or in life, I especially remember the Challenged Athletes trying to learn how to operate their prosthetic legs or their hand cycle to name just a few. If they fall, they dust themselves off and keep going with a smile on their face and courage in their heart. 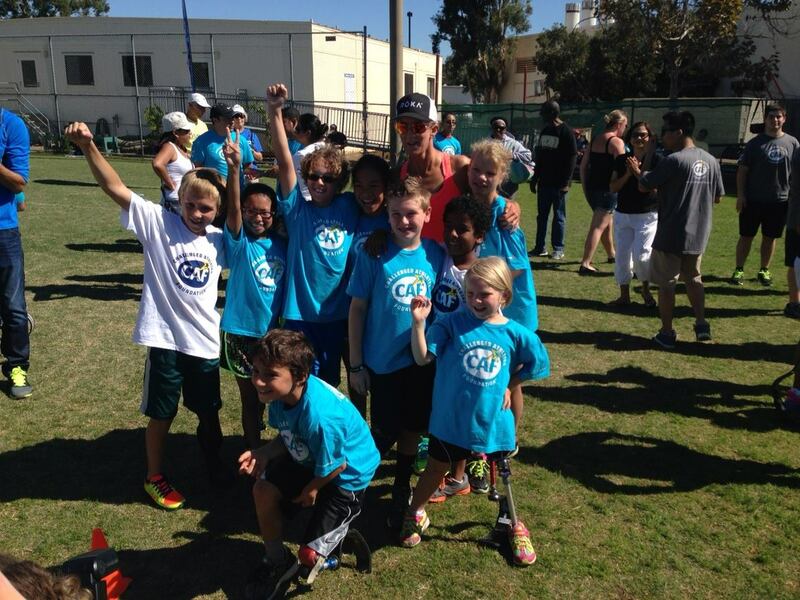 THIS – is true grit and gumption that they inspire and teach me personally – they all enrich my life. 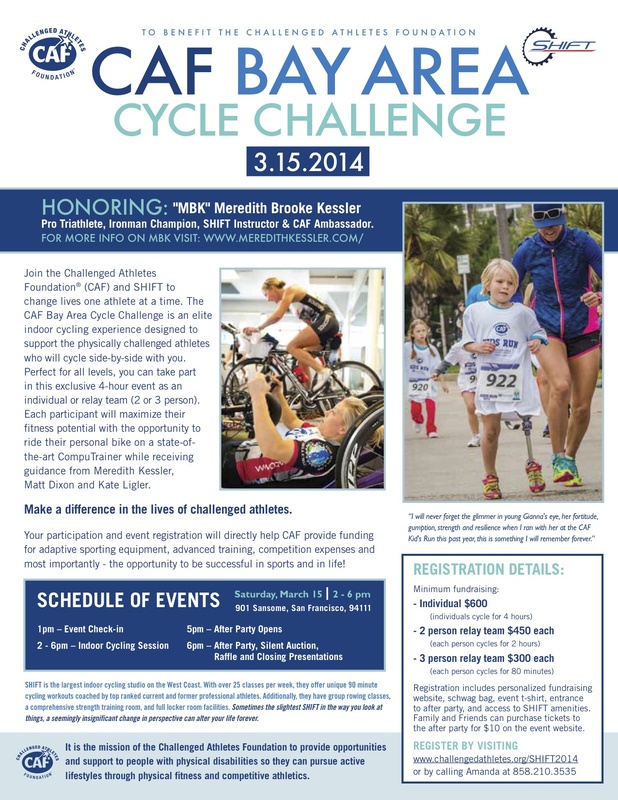 The fourth annual Bay Area Cycling Challenge, for the benefit of the Challenged Athletes Foundation, is happening! 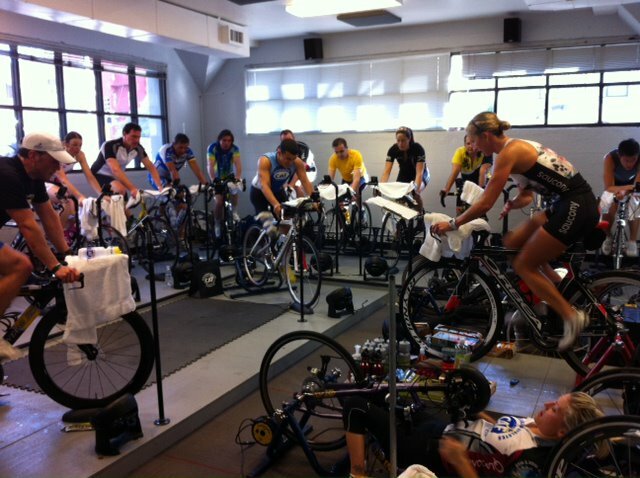 2-6pm Ride (individual or on a team) with coaches Kate Ligler, Matt Dixon of purplepatch and myself to motivate you on this journey – however long you are on the bike! 5-8 Auction, Raffle, Food, Drink, Party! TONS of products, tickets, items and experiences of all kinds – we can’t wait to show you all! **Please keep in mind that you or your team (ie if you are a team of 2 or 3 and thus sharing a cycling slot) can fundraise the money for the slot, donate it individually or BOTH – it is up to you – proper details are shared on the above link and of course, ping me personally with ANY questions. **Also to note: Can’t attend the ride? No problem! Please consider attending the party/auction part of the event before your Saturday evening plans – we would LOVE to have you regardless of whether or not you can participate in the ride. As mentioned, there will be ample food and drinks to go along with our auction/raffle! **Live outside the bay area thus unable to be a part of the day? That’s ok too! You are still able to be a part of it should you want to be involved. You can donate to the event (which is amazing and so appreciated of course) at the same above link (http://www.challengedathletes.org/SHIFT2014 under GENERAL DONATION) and/or we hope to have the auction items out universally so that no matter where you are in the world, you would be able to bid on the items. Much more information about that to come! 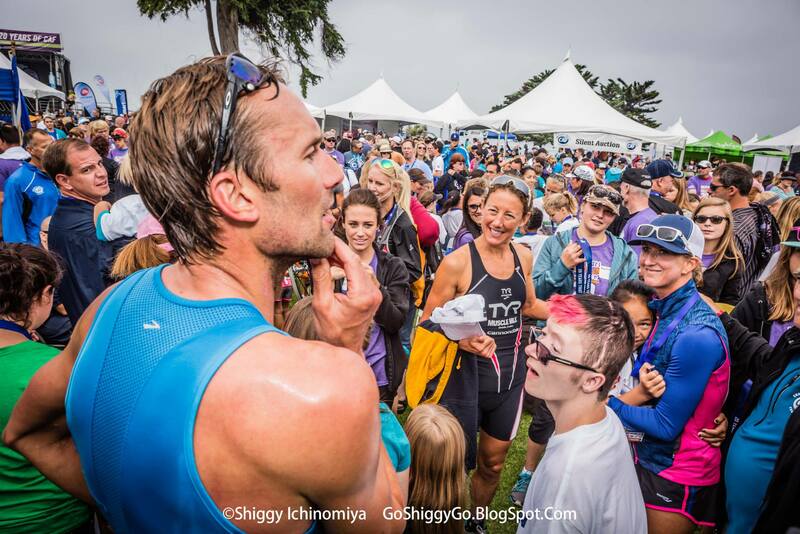 This event has raised thousands of dollars to directly help hundreds of challenged athletes with the goal of helping them achieve their dreams. Our goals are lofty again this year – but you can’t put a price on enriching people’s life. The cycling challenge is a way you can help your fellow neighbors on this planet in this short life we lead; let’s leave it a better place with our humble and selfless actions to help others enjoy life in a way that they might not have thought even possible. It will become one of the most rewarding experiences of your life – giving hope to fellow athletes in the Challenged Athletes Foundation. We VERY much look forward to having you on March 15th!